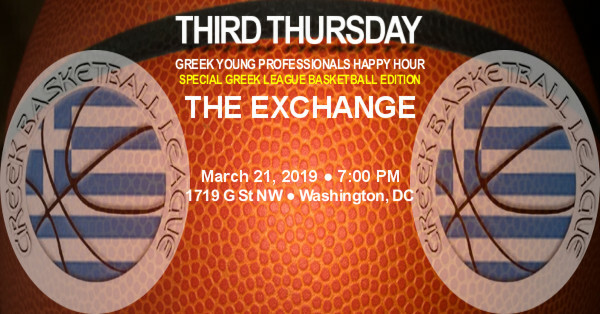 Join us on Thursday, March 21, 2019 at 7:00 PM as the Third Thursday Greek Young Professionals Happy Hour takes in the first full day of the NCAA Division I Men's Basketball Tournament action at The Exchange, DC's oldest Sports Saloon! Joining us for this happy hour will be players and fans of the Washington, DC Area Greek Basketball League which features ten men's and four women's teams competing in a multi-week regular season with championships decided on April 14th! Located steps from the White House, Greek-owned The Exchange features 26 HDTV monitors located throughout three dining rooms, a 6 foot by 4 foot drop down screen Hi-Def projection TV, and state of the art sound system perfect for catching all the day's action. Some of you may remember The Exchange as the host of DCGreeks.com's World Cup 2014 Watch Party Episode I: Greece vs. Colombia back in June 2014. We've secured extended happy hour specials which includes $14 Bud Light and $15 Shock Top pitchers, $5 Jameson and Fireball shots, and selected appetizers, salads, and sandwiches ranging from $5 to $11.